Bio: Jane McGraw, founder of the Muttontown School of Fine Arts and executive director of The Art Circle, promotes the appreciation and development of the fine arts through training, lectures and exhibitions. Ms. McGraw obtained her Masters Degree and teaching degree in New York and studied at the Art Students League in Manhattan with Richard Pionk, Frank Mason and Harvey Dinnerstein. Subjects: Landscapes, portraits, still life. Navigation: Main menu remains available on top throughout. Site is up to date. Gallery: Work: Still Life; Portrait; Landscape. Image View: Each gallery page contains thumbnails that enlarge in slideshow. If however you choose the slideshow option by clicking on “Play Slideshow” in each gallery, you get a pop-up window with the slides little larger than the thumbnails. So, click on the thumbnail you wish to see enlarged, and scroll back or forwards from there. There is no data on dimension of painting, or medium. 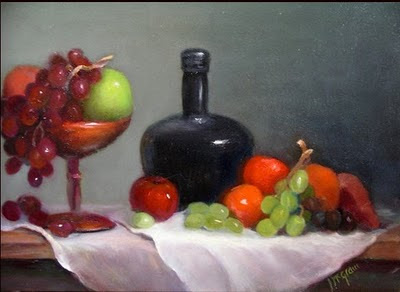 This Pionk-like still life is 580x426, 43 KB. Deborah Secor: Landscape Painting in Pastels.